Posted on Thu, Mar 15, 2012 : 5:58 a.m.
Why write about Public Radio in a cinema news space? Well, public radio is a critical part of the news, information and arts infrastructure of our community. Without AnnArbor.com, Ann Arbor Observer, the USPS, locally maintained Internet / website / social network sources and public radio, we could not present and produce as many successful events as we do in Tree Town. Commercial radio and television are also great, as are many other wonderful publications, but in our community it is public radio that provides the best and most reliable broadcast news and information to our community. Please support WEMU and WUOM, or both, or whatever NPR station is your favorite. I especially hope you call WEMU Thursday morning before 9 a.m. to support "Cinema Chat" on the radio! “Jeff, Who Lives At Home” stars Jason Segel as Jeff, who, on his way to the store to buy wood glue, looks for signs from the universe to determine his path. However, a series of comedic and unexpected events leads him to cross paths with his family (Ed Helms and Susan Sarandon) in the strangest of locations and circumstances. Jeff just may find the meaning of his life... and if he's lucky, pick up the wood glue as well. Peter Debruge of Variety says, “The Duplass brothers take another step toward conventional Hollywood storytelling without sacrificing the sincere, true-to-life quality that got studios interested in the first place.” “Jeff, Who Lives At Home” opens Friday at the State Theatre. “In The Land Of Blood And Honey” is set against the backdrop of the Bosnian War that tore the Balkan region apart in the 1990s. It tells the story of Danijel and Ajla, two people from different sides of a brutal ethnic conflict. Danijel, a soldier fighting for the Serbs, and Ajla, a Bosnian held captive in the camp he oversees, knew each other before the war, and could have found love with each other. But as the armed conflict takes hold of their lives, their relationship grows darker, their motives and connection to one another ambiguous, their allegiances uncertain. Tom McCarthy of the Hollywood Reporter says first-time director Angelina Jolie (yes, that Angelina Jolie) “deserves significant credit for creating such a powerfully oppressive atmosphere and staging the ghastly events so credibly, even if it is these very strengths that will make people not want to watch what's onscreen.” “In The Land Of Blood And Honey” plays March 20, 21 and 26 at the Michigan Theater. “The Flowers Of War,” from internationally celebrated director Zhang Yimou, tells an epic story of love and sacrifice, starring Christian Bale and introducing Ni Ni. The film, set during Japan's 1937 invasion of China, is told from a young girl's point of view, not as a history lesson, but as an intimate, elemental and paradoxically universal celebration of the human spirit. Bale stars as a dissolute Westerner who seeks refuge in a Catholic church. There he meets a beautiful Chinese courtesan who helps him rescue a group of schoolgirls from a terrible fate at the hands of the Japanese. “The Flowers Of War” plays March 20 & 21 at the Michigan Theater. “21 Jump Street,” based on the late '80s cop drama, follows two rookie cops, Schmidt (Jonah Hill) and Jenko (Channing Tatum), who are more than ready to leave their adolescent problems behind. Joining the police force and the secret Jump Street unit, they use their youthful appearances to go undercover in a local high school. As they trade in their guns and badges for backpacks, Schmidt and Jenko risk their lives to investigate a violent and dangerous drug ring. But they find that high school is nothing like they left it just a few years earlier—and neither expects that they will have to confront the terror and anxiety of being a teenager again and all the issues they thought they had left behind. 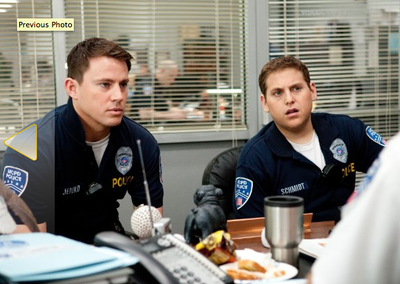 “21 Jump Street” opens Friday. “The Comedy Of Errors” brings Dominic Cooke, director of the Royal Court Theatre in London, to the National Theatre of Great Britain for the first time. Two sets of twins separated at birth collide in the same city without meeting for one crazy day, as multiple mistaken identities lead to confusion on a grand scale. Shakespeare’s furiously paced comedy will be staged in a contemporary world into which walk three prohibited foreigners who see everything for the first time. National Theatre Live: “The Comedy Of Errors” plays Sunday, March 18 at 7 p.m. and is presented by the University Musical Society and the Michigan Theater. Thu, Mar 15, 2012 : 3:27 p.m.
Jonah Hill is like Oprah. I saw him last night on Jimmy Kimmel and he was a lot more, shall we say, stout, than he is in the picture on here. Thu, Mar 15, 2012 : 3:19 p.m. Comment! Thanks for the weekly film release synopsis, Russ, always like the WEMU radio show. Now let's go ahead and close the commenting on this article and keep my odds of winning tix at 50%! As a follower of the Duplass brothers films I am so ready to see how they tell this story. From the indie film THE PUFFY CHAIR to CYRUS, each film gets more attraction from eager stars to show their talents in a more thoughtful manner than the usual overdone hollywood style of today. With greater access to small films it is exciting to watch some talented and outside of the box thinkers approach film. And, they two are very funny.